So many of my favorite things + my go-to color palette, all in one casual look! These distressed jeans are perfect for adding a touch of chic to your outfit and less than $100. And you all know how much I love a simple, white tee. I literally have close to 15 in my closet and this one has quickly become one of my favorites! Perfect look! So casual and still so chic! Looking absolutely amazing in this outfit! Your trashed jeans and a boy bag are top notch pieces! I love blush and white with light-washed denim - it's so feminine and perfect for spring! 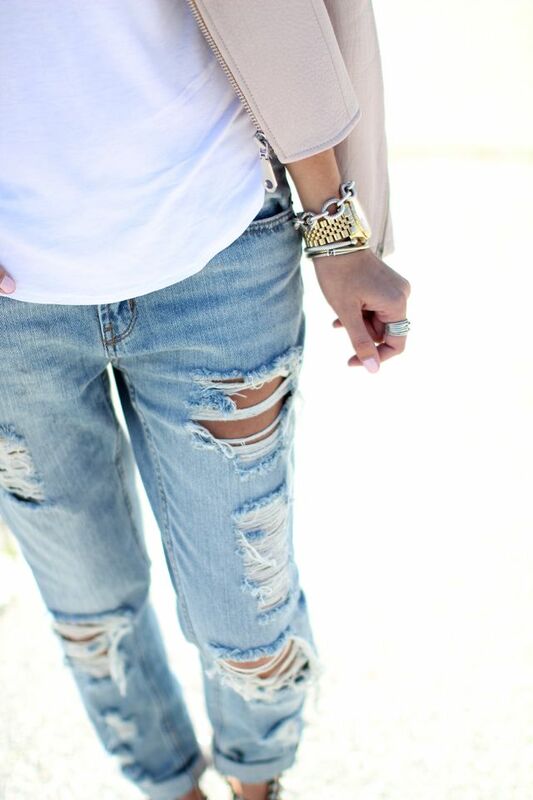 Those jeans are amazing, I've never had boyfriend denim but I might have to give these a try! Glad you had a great weekend! I'm slightly obsessed with this. It's so chic! You look great as always! What I wouldn't give to raid your closet! I'm especially in love with that Chanel bag. I just saw that they also have it in blush and putty. LOVE! Dying at that leather jacket! I'm a sucker for jeans and a white shirt! Loving this look girl! those shoes are great! That leather jacket is absolutely gorgeous, the colour is beautiful on you & I love how you styled it! I need those jeans in my life! Hope you're doing better :) Your hair looks amazing! So chic. Love how effortless but stylish this look is with just a few main key pieces! This combo is so chic. Loving the sandals! I have been wanting to get one of these for the longest time, and I LOVE how you styled your!